The Child Sexual Exploitation e-learning resource and training film below have been developed to help health services staff to understand and help children and young people who are at risk or who may be affected by child sexual exploitation. 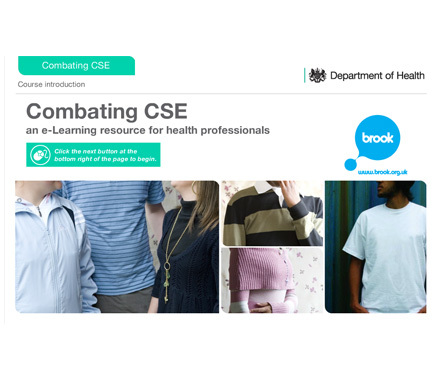 The online learning tool, developed by Brook and funded by the Department of Health, will help healthcare staff in preventing, identifying and responding to child sexual exploitation. This training film was produced by Health Education England, in association with the Department of Health, and with the support of healthcare professions, to help health and community staff identify the signs of child sexual exploitation (CSE) in vulnerable young people. It features scenarios involving a young person at risk, presenting with the warning signs of CSE, and the voice of a real-life victim who talks about her experiences with a CSE gang. The film provides practical advice on what to do if any professional working in the healthcare system suspects a patient or person in their care is at risk, how to help them and alert the appropriate agencies, reporting any suspicious activity that could cause CSE harm. Please view and share this resource with your healthcare professional networks, and support the ongoing #stopCSE campaign. The Department of Health and national charity The Children’s Society have worked together to develop an interactive e-learning course designed to help healthcare staff spot the signs of child sexual abuse and exploitation. One hour of your time could make a vital difference to a child’s whole life. The online course was developed with children and young people based on their experiences and features powerful drama about a young boy called Tyler. The course will give you the skills to know what to look for when you come into contact with a child or young person. CSE: what is child sexual exploitation? Please note that if you access the content below, you will not have to log in but your activity will not be tracked and you will not be able to generate a record of completion. If you require evidence of learning, please register and then log in to access this programme on the e-LfH Hub. This e-learning session provides an introduction to Child Sexual Exploitation for all clinical and non-clinical healthcare staff. If you already have an account with e-LfH, then you can enrol on to the Child Sexual Exploitaion programme by logging in to the e-LfH Hub, selecting My Account > Enrolment and selecting the programme. You can then access the programme immediately in the My e-Learning section. The Child Sexual Exploitation programme is also available to NHS healthcare staff via the Electronic Staff Record (ESR). Accessing this e-Learning via ESR means that your completions will transfer with you throughout your NHS career.